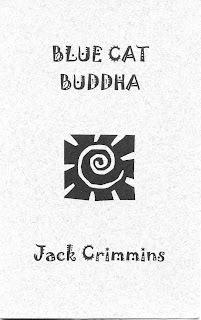 A handful of new poetry books by California poet Jack Crimmins have come across my desk and there is some solid work to pass along. Two I've had the chance to look at are very good, indeed: Blue Cat Buddha and Summer / War / Haiku. Wind grips the wet coast. more because there's three things there. Seems to me, since poets are so notoriously under-compensated, that Micheline has come up with a sliding pay scale for poets as well as artists: payment by the number of things you stuff into a poem. Seems fair; the poor poet can try to catch up on back rent knowing what's needed. Might even encourage some moderns to put something in their poems. I'm not sure where these chapbooks might be obtained (N. B. abebooks sounds like a good bet, plus see Jack's comment to this post) or what the prices might be. Blue Cat Buddha is 12 pages and Summer / War / Haiku is 20 pages. Both are published by Low Tech Press (P.O. Box 191 Kenwood, CA 95452), so that would be the logical place to start. And don't be fooled by the name: the chaps are simple but functional in design and execution, a very nice addition to anyone's shelves. Had to grin at the sliding pay scale. found a copy of "Summer / War / Haiku" (signed) at AbeBooks, thanks to your review just ordered it. Hope you enjoy it, Greg ... lots of interesting, different haiku I think you'll like. and in my book,"Kit Fox Blues", at Small Press Distribution. By the way, I'm in California. Thanks very much for your work in poetry. Good to hear from you, Jack. Corrected the California snafu, plus inserted abebooks and a note to see your comment in the post. You should be getting a packet of goodies from me soon. Don,I'd just like to add that I think your blog is one of the best around. I'm thrilled that you've featured Jack Gilbert quite a bit; having spent a little time with Jack I know he'd be touched. Your mixture of poetry from various places on the poetry wheel and wonderful music videos is incredible. Muddy Waters and James Cotton, Sonny Boy Williamson II (your post led me to find Sonny's great "Bye Bye Bird" on youtube), on and on. I'm thankful to be a part of the scene. Also, if folks are in the SF Bay Area,go check out Jeff Maser's poetry warehouse. He and Andrea have tons of modern and post-modern poetry plus broadsides, etc. Its my favorite place for books. There's a write-up on Jeff & Andrea at dbqp visualizing poetics blog. And, thank you to Greg Schwartz for buying Summer War Haiku! Jack, I linked up Jeff shop online to the Bookshops section along the sidebar on the right. I'm determined on this blog not to link to amazon and try to spread the biz amongst independents. We've been to SF a handful of times - our fav US city - and always do a bookshop tour. We'll make sure to include Jeff's next time. Finally, your kind words are deeply appreciated.